Queries are, next to Commands and Events, a fundamental building block of any CQRS/Event Sourcing based application. As such, they're supported in Axon Framework since 3.1 by means of a QueryBus and @QueryHandler methods. But something has been missing so far: these queries were executed in a simple request/response fashion, whereas in reality many modern applications are showing live, asynchronously updated data to their users. Axon Framework 3.3 has introduced subscription queries to bridgethis gap in a truly elegant manner. In this short, all live-coding webinar, we'll take an existing Axon application with a GUI featuring synchronous, user initiated data refreshes, and transform that into a live updated system using the new subscription query functionality. A must-see for all Axon users wanting to get the most out of Axon's new features! Frans is an evangelist at AxonIQ. 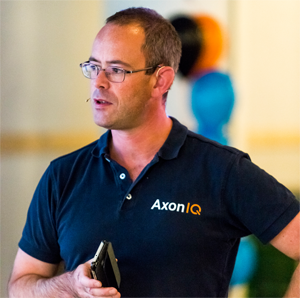 He works with existing and prospective Axon Framework users, specifically looking at how AxonIQ's products and services can help them be successful. Also, he tells the world about Axon by speaking at conferences, running webinars, writing blogs, etc. Before joining AxonIQ, Frans was a presales architect representing Fortify, the world's leading application security testing portfolio, having worked as both a Java architect and security consultant before that.